Bloom, a startup based out of the San Francisco Bay Area, has announced a blockchain-based initiative to build a decentralized credit platform. Bloom is building a protocol for identity verification, risk assessment, and credit scoring using Ethereum and IPFS. Bloom itself will not initially be a lender, but rather, a platform to facilitate lending between lenders and borrowers. Within Bloom’s programmable ecosystem will live the ability for people to transact in on-demand global credit services. The company hopes to migrate existing lenders to the blockchain using their platform to issue compliant loans. BloomID: A global identity allowing borrowers to receive loans without exposing personal information to financial institutions. BloomIQ: Bloom’s system of record for the reporting and tracking of all the debt obligations tied to a person. 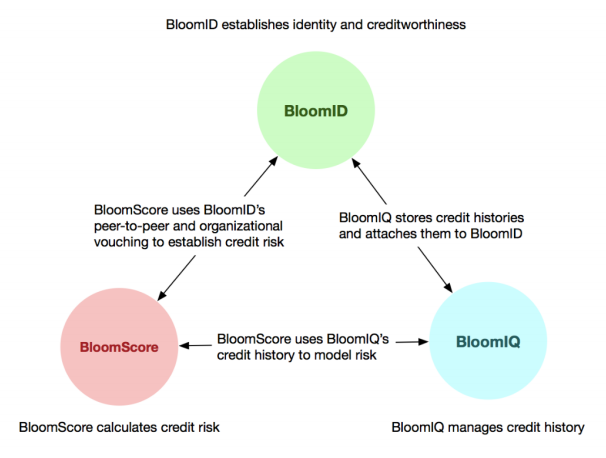 BloomScore: Similar to a FICO Score or VantageScore, but using a proprietary model. The Bloom Token is both the currency and governance mechanism of the Bloom network. The token will allow organizations to participate in evaluating user identities and credit worthiness. The startup cites that companies using the Bloom network will pay for identity verification and risk assessment using the Bloom token. Additionally, Bloom will leverage Aragon to allow their token holders to vote on changes to the underlying protocol. Finally, similar to the relationship Credit Reporting Agencies (CRAs) have with certain businesses in which payment history and debt obligations are reported and used as data points in determining a credit score, the BLT token will be used as currency in such relationships on the Booom network. No pre-sale or ICO date has been provided yet. While being a mammoth undertaking, the network effects of being the winner in this space are undeniably lucrative for the network and a net win for society. Bloom’s goal of expanding credit access and choice is admirable. Regulatory: How well Bloom can navigate the regulatory landscape across nation borders? Execution: Will the team be able to execute on such an ambitious plan? Credit risk: Can Bloom convince lenders to take a gamble on their users who may not have any credit history? Institutional adoption: Financial institutions are known for being resistant to change and moving slowly and methodically, which is why onboarding such institutions may take longer than expected. All of this said the timing could not be better. With news of Equifax’s 143M user data breach, we believe both consumers, lenders, and regulators will be willing to entertain new solutions. Bloom looks to have both an impressive team and set of advisors to build this new type of solution for a modern era.